Lay slices of cheese onto one piece of bread. Set aside. Then, in a small frying pan, add 1 tsp of butter, dandelion greens, garlic, and salt, and heat over medium until garlic is fragrant and dandelion greens are wilted, about 5 minutes. 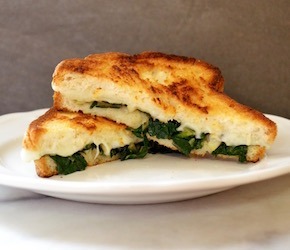 Remove the cooked greens from heat and scoop onto the piece of bread already prepped with cheese. Place second slice of bread over top. In a medium pan, heat 2 tsp of butter until sizzling. Place sandwich in the pan and heat for 5 minutes or so, or until the bread has browned deeply. Flip the sandwich over, and repeat until the other side has browned, and the cheese inside has melted. Remove sandwich from heat, and slice on the diagonal. Serve and eat immediately.